The first thing you notice about the Marble Ray is its great size. It can be 3 m (10 ft) in length and 1.7 m (6 ft) wide. Round in shape it is covered with a dense pattern of black spots. It is not aggressive but you need to be careful of the spines on the tail. You see the Marble Ray in the Indo-West Pacific: Red Sea and East Africa to southern Japan, Micronesia and tropical Australia; and in the Cocos and Galapagos islands in the Eastern Pacific. It occurs in a wide range of habitats, from shallow lagoons to outer reef slopes, and usually has other fish like jacks swimming near them. Carnivorous, the Marble Ray eats bottom fish and crustaceans. The female bears live young: the eggs are kept in the body of the female where the embryo develops. Up to seven pups hatch from the egg capsules and are born soon afterwards. 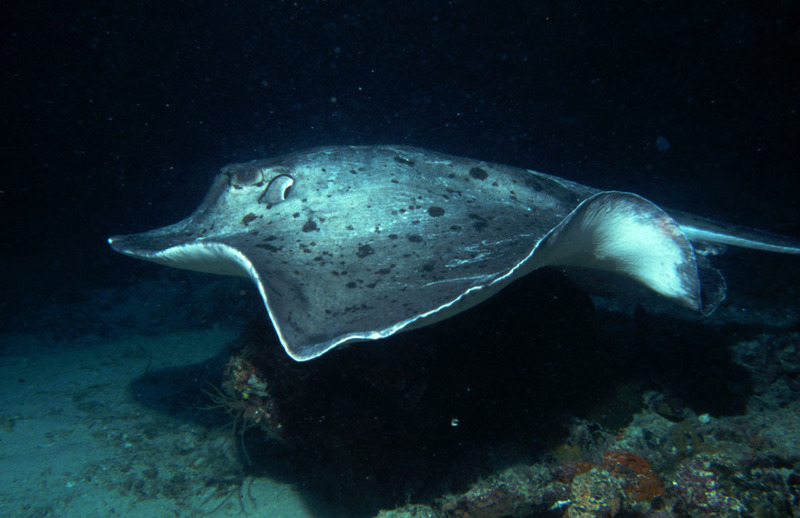 The ray is classified as "vulnerable" on the IUCN Red List of Threatened Species. This means that it is at high risk of endangerment in the wild. Kyne, P.M. & White, W.T. 2006. Taeniura meyeni. In: IUCN 2009. IUCN Red List of Threatened Species. Version 2009.2. .